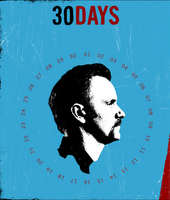 This week, Kevin and I watched two great episodes of 30 Days that had to do with being on the job. Working in a Coal Mine is an up-close look at the day-to-day life of a coal miner. I don't think it's possible to watch this episode and not think a little harder about energy consumption. Outsourcing follows an American data programmer whose job has been outsourced to India. He hops on a plane and for 30 days, works at a call center in India. Absolutely fascinating. I know I've said it before, but this show is brilliant. Could someone please tell me why there isn't going to be a season four?